Discussion in 'Classic Muppets' started by Philip Kippel, Dec 14, 2003. Hello everyone. This is Philip Kippel again. 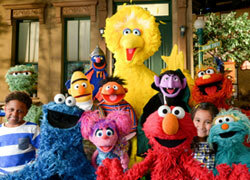 The skits that the Muppets did on "The Ed Sullivan Show" are very funny, creative, well done and fun to watch. Which Ed Sullivan show Muppet skits do you like the most? Hands down, Java. Period. I've loved that sketch since I was 2. Did anyone see the Holiday Ed Sullivan DVD? I saw it today at Suncoast for the 1st time. It comtains various Holiday clips including Muppet ones. Although I don't know what specifically is on it I was surprised to see it. I love Rock n' Roll Monster, as well as Monster/ Machine. I think the latter was done more successfully on Sullivan than on TMS. "I Feel Pretty" (I like Amanda, since she's like an AM when making herself beautiful, and Conrad Love, who later became the puppet used for Guy Smiley, since he looks A LOT like Chance the Gardener in "Being There" LOL! "Happy Girl Meets a Monster". Great to see how the Beautiful Day Monster thing began in Muppet skits. Also like seeing the tiny finger-puppet version of Beautiful Day. I was even amused of the blooper involving the flower pot falling off the wall long before Beautiful Day was supposed to throw it down. And the way whoever handled the props managed to hand up the pot again just in time to be smashed down again on cue. Jim did all the voices, but I have a feeling it was Frank who played the Monster. It's one of my favorites, too. Frank was playing the girl, and Jim Beautiful Day. Frank was lip synching with the puppet to Jim's voice. The audio was prerecorded. 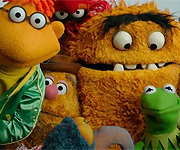 My favorite skits are Mahna Mahna, String Quartet, Arthur Godfrey as Santa Clause, The Computer Dinner, Girl Meets Monster, Buisness Buisness, Inchworm, and Scryap Flyap. I loved the Octopus's Garden skit. Jim was the swimmer, Frank was the Octopus, who was acting a lot like Fozzie. And I believe Jerry was the small clam. The Christmas Reindeer skit was cool too. I recognized Jim and Frank's voices in that one. And I liked how Mahna Mahna had an funny speaking role in Stringed Quartet and how Jerry voiced the leader of the quartet. I believe Richard and Frank were the other two guys as well. And Business Business was cool and it kind of shows the truth in life. Sometimes, people start up something wonderful and nice to make everyone happy. But then later on when it becomes successful, things change and it starts becoming business to them. It's great looking back on early puppets and personalities and hereing the various voices used for different characters such as Fozzie as a Reindeer.